Japan's Golden Week holidays end tomorrow, so tonight roads and highways across the nation are jammed with people returning from vacations. News reports of 50-mile backups on major expressways are not uncommon. Unfun. 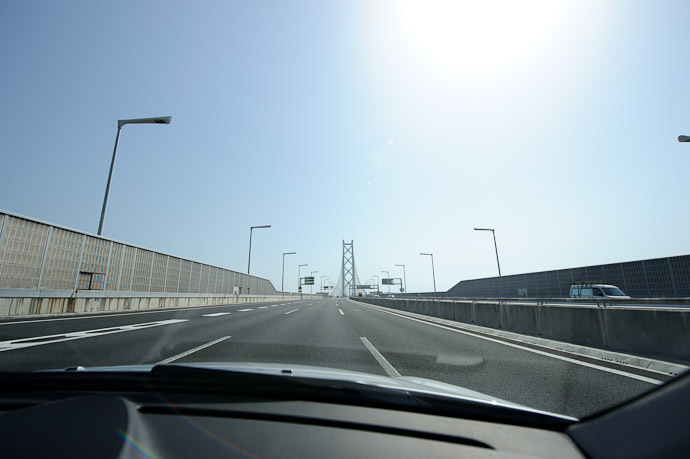 We avoided all the traffic by having our mini vacation on Awaji Island early, so the roads were empty both going and returning. On the way there, we crossed the Akashi Straights Bridge (明石海峡大橋) — the world's longest suspension bridge, though tonight it's the world's longest parking lot — and while crossing it, I stuck the camera out the window for some flying(driving)-blind shots. I wrote about this bridge on my “Heavy Lifting: Supporting the Longest Suspension Bridge in the World” post, which gives details about the two massive cables that support the bridge. 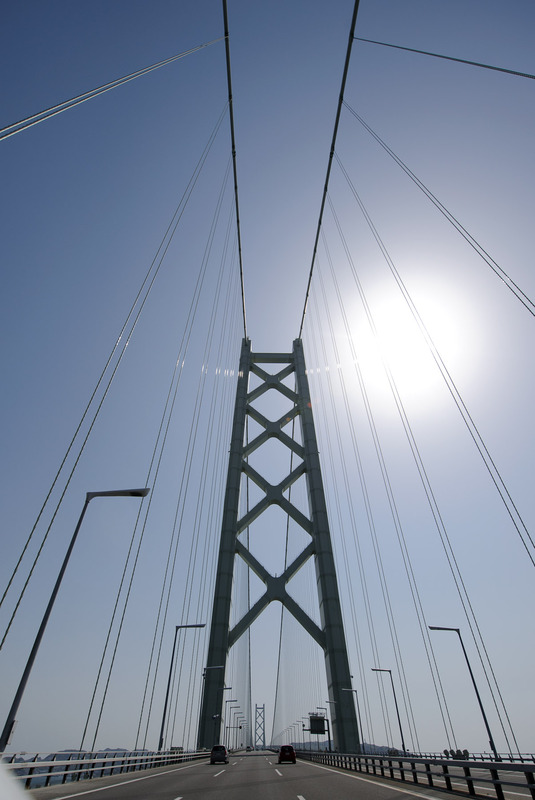 This is a suspension bridge, so the entire road deck — the thick layer of concrete and asphalt and girders, and all the traffic — are suspended in mid air by the many vertical cables hanging from the two big cables. If the two big cables were to break, or come loose from their moorings on either side, the whole bridge would collapse. 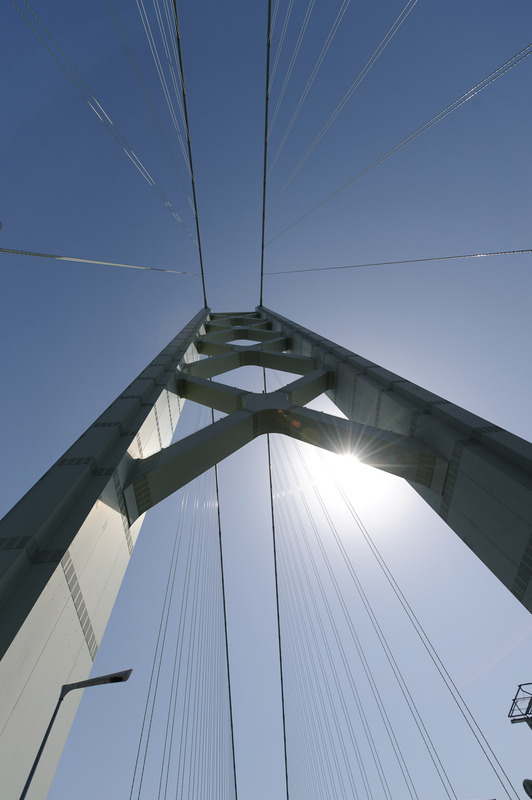 The two cables are draped across the two towers, so the entire weight of the bridge and its traffic are concentrated onto those two very tall (300m above the water) points. But, of course, those driving across don't think of any of that amazing engineering. They're probably thinking of what they're going to do on the other side... perhaps a Ferris wheel ride, or a visit to a flowery park. I thought of those things too, but mostly, I marveled. Your photos and description reminds me about old PC games: Bridge Builder / Pontifex. BTW: Why did you describe it as “parking lot” ? Can you park car in the middle of the bridge? I’m a black South African and a teacher by profession. I once watched the construction of this state of the art bridge on a National Geographic Channel and was speechless. To me this is one of the man-made’s “wonders of the world”. I wish I’ll visit this Japan marvel before 2015.